Introducing Insight! A DVD-administered group test of cognitive abilities based on CHC theory. The Canadian Test Centre, in conjunction with Dr. Lynne Beal, the Toronto District School Board's former coordinator of psychology, has created Insight*, an innovative cognitive abilities assessment. Insight is based on the widely accepted Cattell-Horn-Carroll (CHC) theory of cognitive abilities and is designed to be used as a group-administered screening instrument. 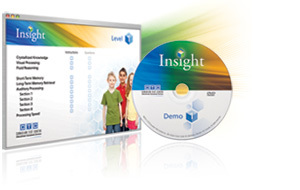 Insight is administered by DVD video and is effective for assessing CHC-defined abilities critical to developing reading, written language and mathematics skills. * Beal, A., Lynne (2011). Insight Test of Cognitive Abilities. Markham, ON: Canadian Test Centre.